85% fewer calories than white rice. The lower calorie carb-alternative. Made from nothing but cauliflower. 100% vegetables. No additives or preservatives. Non-GMO. Gluten-free. Serve in place of rice and grains. 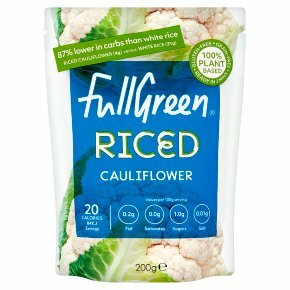 Suitable for vegans.Cauli Rice is a quick and easy, lower calorie carb alternative. It also counts as a serving of veg! Serve it in place of rice; in low carb pizza bases, veg-filled stir-frys or hearty grain-free salads. (2 1/2 minutes) 900 WMicrowave in an uncovered bowl for the time shown. Reduce cooking time if your oven is more powerful than 900 Watts. You can also microwave Cauli Rice in the pouch: just tear-off the top and cook. (2 1/2 minutes) MediumSaute in a non-stick pan on a medium heat. There's no need for oil. For best results add fresh herbs or spices and season to taste. Serve steaming hot.